This tour departs from 1597 Lower Water Street at 6:30pm. This 2.5 hour cruise is your classic evening sail. Enhanced by a multitude of Nova Scotia fine wines and cheeses the J Farwell staff will cater to your every need while you enjoy the majestic sights and landscapes. This cruise brings together all the elements of Sailing, taking full advantage of mother nature's power. Guests can become very involved in the experience or sit back and enjoy the sail. This tour departs from 1597 Lower Water Street and is 2.5 hours long. 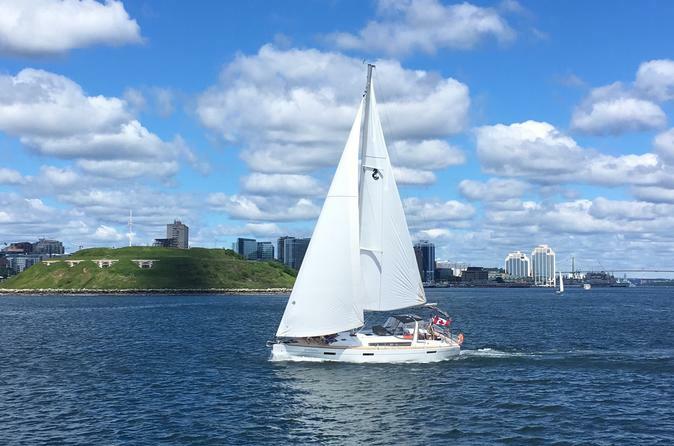 Throughout the tour you will enjoy the beautiful scenery of the Halifax Harbor. This tour will provide you with an authentic sailing experience. And if the conditions permit on the downwind, the massive spinnaker will be set. An iconic Nova Scotia Must Do. The maximum group size of this tour is 12 people. Each guest will be well versed on 4 distinct Nova Scotian wines across the region. All guests will enjoy a 2-3 oz sampling of each wine throughout the cruise. A traditional Nova Scotian cheese tray will accompany the wines.